Renting a car has officially become the most satisfying part of the North American travel experience. According to the J.D. 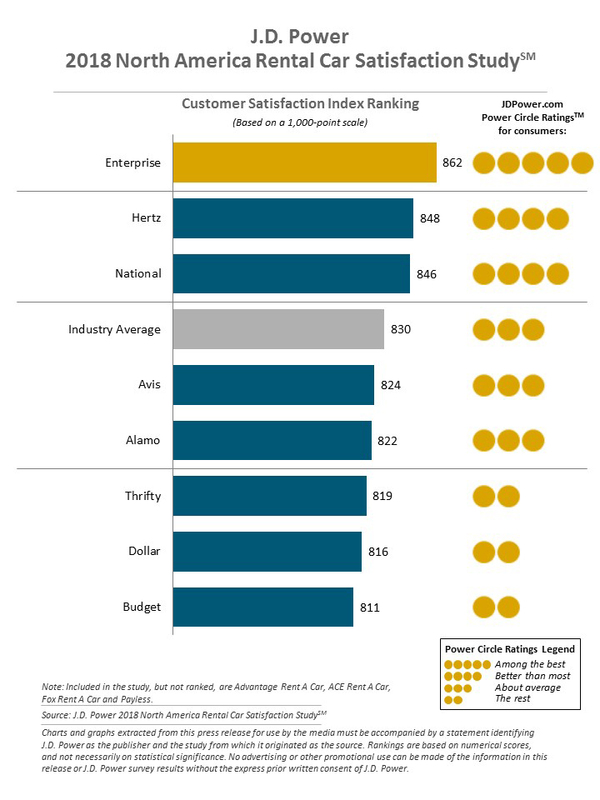 Power 2018 North America Rental Car Satisfaction Study,SM customer satisfaction with airport-based rental car companies has climbed to a record high of 830 points (on a 1,000-point scale), topping satisfaction scores in J.D. Power 2018 studies for hotels, airlines and airports. Record-high rental car customer satisfaction: Overall rental car satisfaction improves by 4 index points to 830 in 2018, the highest level recorded in the 23-year history of the study. The performance improvement is driven by increases in satisfaction in three factors: reservation, rental car and cost & fees. Satisfaction higher among app users: Overall satisfaction among customers who use a brandâ€™s mobile app is 58 points higher than among those who do not. Currently, just 30% of customers say they use a rental car mobile app. Rental car apps are used most frequently for making reservations (47%); getting information (42%); and check-in (40%). Copyright 2018 J.D. Power. All rights reserved. From https://www.jdpower.com.